After the Open Day in April, Triumph scheduled for the Saturday 14th of June another national event involving its network of dealers in the UK. 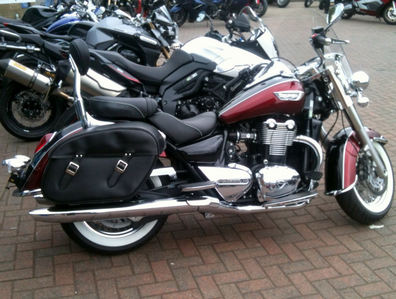 This time, the focus was on Triumph's fantastic range of cruisers, i.e. Speedmaster, America and the new America LT (Light Touring) through to the Thunderbird range including the new Commander and LT models, as well as the awesome Rocket III with its 2300cc engine - the largest production engine of any motorcycle in the world. Pure Triumph launched an invitation via their newsletter, asking those interested to book a ride. After spending the morning in Daventry for the 2014 edition of their Bike Fest, I arrived at the dealership in time for my 2.00 pm appointment. The sky was menacing, but short of some very light drizzle, the afternoon stayed dry. I was offered a coffee by the lovely Sarah and got introduced to some of the staff whom I had not yet the pleasure to meet. Before making my way outside after filling the usual waiver form, I had a quick browse at the cruisers on display. The pictures below show most of the current cruiser line-up, i.e. 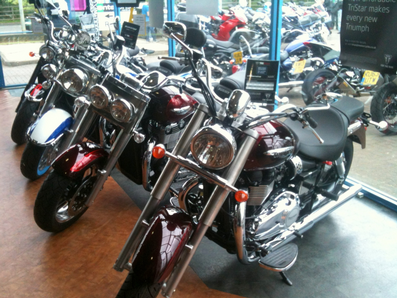 Bonneville America, Thunderbird Commander, Thunderbird Light Touring, Rocket III Roadster. The Thunderbird 1600 is out of the picture, and so were the two special Pure Triumph custom editions of the Storm (with custom paints from 8-Ball that you have to see for yourself, breathtaking!). OK, I'll raise my hand. Up to this past Saturday, I was a cruiser virgin. Well... not quite. I had sampled the "delights" of bad road handling with a Harley-Davidson Speedster 1200, and tried a Yamaha Midnight Star once, but had never ridden a Triumph cruiser before. So I was looking forward to my first encounter with the big lumps of metal that are the Thunderbird LT and the Rocket III Touring. And here they are. The first thing you noticed when you see these two is their sheer presence. If, like me, you're more used to Daytonas, Triples and Sprints, you feel like you've abandoned your two door sports coupe for an estate. The second thing that came to mind was the quality of the finish and the attention to details. The RIII was registered in 08; so when you think it is six years now, then you realise how durable and well put together it is. Always good to know your hard-earned cash is not buying a motorcycle that will need a complete bodywork overhaul after a few years! After Rob showed me the controls (but aren't they always the same? 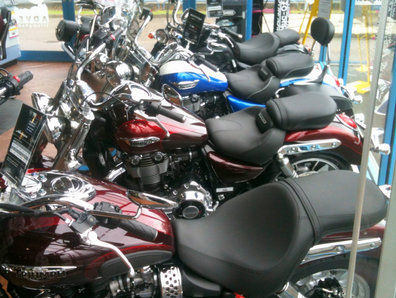 ), I sat on the LT, set the mirrors, started humming Steppenwolf's Born to be wild, and off I went. At this point, I must have looked like a right pillock as I was wearing my set of racing leathers with armour and back hump on the jacket; not quite the Peter Fonda look, but nevermind... I started by taking the A45 so I could get a feel for what's touring at 70 mph is like. Then back to town where I took the LT for a longer ride in the centre of town, curious to see how such a heavy motorcycle fares when ridden at 15-20 mph in traffic. Taking the LT back to base, I took some time to jote down notes on my experience. Overall, a big thumbs up. Riding this motorcycle was so much easier than I thought it would be. Triumph have done a great job on the balance of the bike as it is super easy to take an angle and corner. Acceleration was frank, not many vibrations, quite confortable and strong brakes. The only thing I found difficult was to get used to my feet being so much more forward compared with other bikes. However, I did like having footboards instead of pegs, and the heel-and-toe gearchange was very useful. The only niggle for me, but it is not a negative point as such, more the result of not being used to the seating and leg positions, is that I was a bit sore when parking the LT. Clearly, the ride made me exercise some muscles that are not used to work when riding my Sprint. Final remark from a practical point of view, it was quite easy to reverse the LT to park just using my feet; not always a gimme with something that heavy, proving once again that Triumph got the geometry, centre of gravity and balance spot on. After a short break, Rob prepared the RIII for me so I could have a quick ride and compare it with the LT I had just experienced, an interesting proposition, both being tourers. So got myself ready, set the mirrors, starting humming, this time Joe Satriani's Ride, and rode mostly on B roads around Earls Barton, to return and park at Pure Triumph after about 20 miles or so. I was expecting to have a clear favourite, one of my motivations to book a ride in the first place, but I was left as confused after as I was beforehand. For me, there was no clear favourite and I would be happy riding either. The footboards on the RIII not being as forward as those of the LT meant it was easier for me to find a comfortable position, and the RIII accelerates a bit quicker, but I wouldn't want to take a purchasing decision based purely on those two observations. So the conclusion is simple. Kevin, can I have both (particularly the 8-Ball Storm)?! 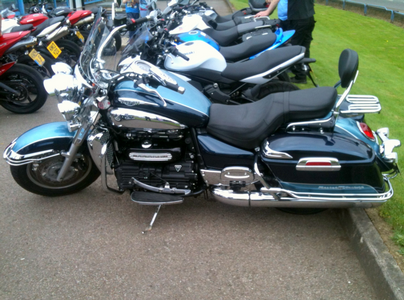 Thanks to the staff at Pure Triumph Wellingborough for making this an enjoyable afternoon.